If Audio Damage has done its job right, you should be able to get your head around this interface pretty quickly. 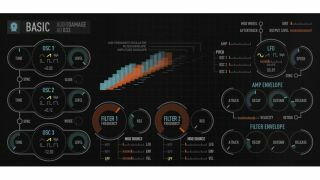 There can't be many gaps in the synth plugin market these days, but Audio Damage says that Basic, its new instrument, was developed specifically because there was no "commercial-quality, low-cost, three-oscillator subtractive monosynth" available. Designed to be easy and simple to use, this promises aggressive and self-resonating filters in the MS-20 style that "scream when pushed". The workflow is inspired by the likes of the Minimoog, SEM and aforementioned Korg synth, while Basic is also said to be touchscreen friendly. As for the "low-cost" bit; well, at just $39, we'd say that it certainly falls into that category, though the price will rise to $49 after 4 September. Find about more about Basic and buy it in 34/64-bit VST/AU formats for Mac and PC on the Audio Damage website. Three alias-free wavetable oscillators with six waveforms each, and oscillator sync. A pair of cascaded filters featuring MS20-style lowpass and highpass, and a bandpass of our own design. A four-waveform tempo-syncable LFO with waveshaper. ADSR envelopes for amplitude and filter frequency. A simple and easy-to-understand workflow, inspired by the classic topology of vintage analog synths like the Minimoog, SEM, and MS20, but with modern usability. Touchscreen-friendly and highly visible user interface. DRM-free, for easy installation and updating.